A Secured Promissory Note is a document that allows a Lender to lend money with the added insurance of having assets property to be handed over to them in the chance the Borrower defaults. This type of note carries less risk to the Lender and usually allows the Borrower to pay a lesser interest rate. Un-Secured Promissory Note – Offers no guarantee for the Lender to recoup the loaned money. What is a Secured Promissory Note? A secured promissory note is a legally-binding agreement between a lender and a borrower. A secured promissory note often comes with the loan and stipulates the terms and conditions in which the borrower is expected to pay back the loan. As an extra assurance to the lender, the “secured” promissory note will include some form of collateral. This is in case the borrower defaults on the loan. The collateral will ensure that the lender receives the value of their investment back in full as agreed upon by both parties. If you are thinking of borrowing or lending a significant amount of money, you may want to consider using a secured promissory note. It’s a great financial document that comes with loans, and it helps to mitigate risks between both parties. However, a secured promissory note is not to be taken lightly. As the borrower, you’ll want to be absolutely sure that you can pay off the loan before signing a secured promissory note. Promissory notes often come in a couple of forms. The “secured” promissory note is often the safest and offers the most guarantees to the lender. This is because collateral is added as security to the loan. A specified piece of property such as real estate, accounts, and other assets can all be used as a form of collateral to secure the promissory note. These specified properties and assets will then be secured by the lender or bank if the borrower can’t make payments or is late on paying their loan within a 90-day period. After this 90-day period, the loan will go into default and the lender can demand the loan be paid in full or collect the specified collateral through a debt collection agency. When is it Necessary to Use a Secured Promissory Note? A secured promissory note is used in almost every instance between a lender and a borrower. It’s just the most secure method of lending money, especially when a lot of money is involved or if the deal is made between two strangers. You want to have a record of the transaction in writing. Secured Promissory Note VS. Unsecured Promissory Note? 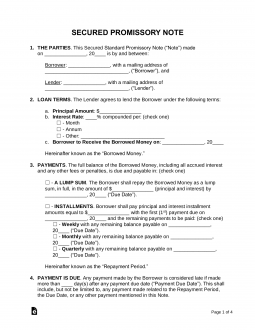 As was previously mentioned, there are various types of promissory notes. The two most common ones are the secured promissory note (mentioned up until now) and the Unsecured Promissory Note. Both types often include the same key elements necessary for a promissory note. However, the unsecured promissory note doesn’t offer the same assurances and securities for the lender against defaults on the loan. In other words, the unsecured promissory note doesn’t include any form of collateral. Unsecured promissory notes have a lot more risk associated with them. Because of that, they are often used in cases where the amount of the loan is less significant, the borrower is a high-worth client with a lot of good credit, or among parties that are quite familiar with each other (i.e., friends and family). If the loan does go into default, the lender can still file a demand for repayment, collect what’s due through a debt collection service, or settle the repayment through a small claims court. However, these processes for repayment often don’t come without their own costs. Most lenders would prefer to avoid losing more money just to make back a part of their investment (which the borrower may be completely unable to pay back).